The summer is coming and so are some great learning opportunities beyond high school! NOTE: Deadlines for summer programs are in February, with some early round deadlines in January. Admission is selective. Limited financial aid is available. 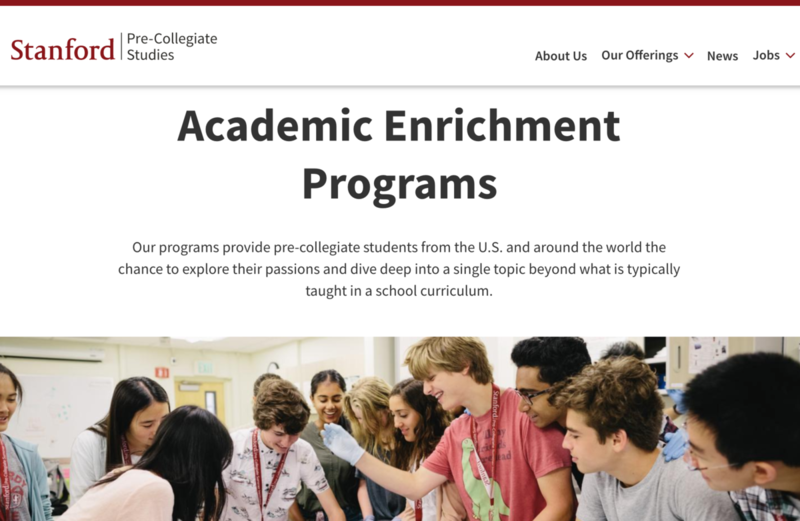 Learn more about Stanford's Summer Programs at Stanford's Pre-Collegiate Studies website. The Girls Who Code Summer Immersion Program is a FREE 7-week introductory computer science program for 10th-11th grade girls going into their junior or senior year of high school. During the 7-week program, girls learn about computer science, gain exposure to technology careers, and join a sisterhood of girls who are using computer science to become change-makers in their community. NOTE: The deadline to apply is March 15th. Girls Who Code offers stipends of up to $1,400 to cover transportation and living expenses to those who qualify. Learn more and apply at https://girlswhocodesm.smapply.io/.